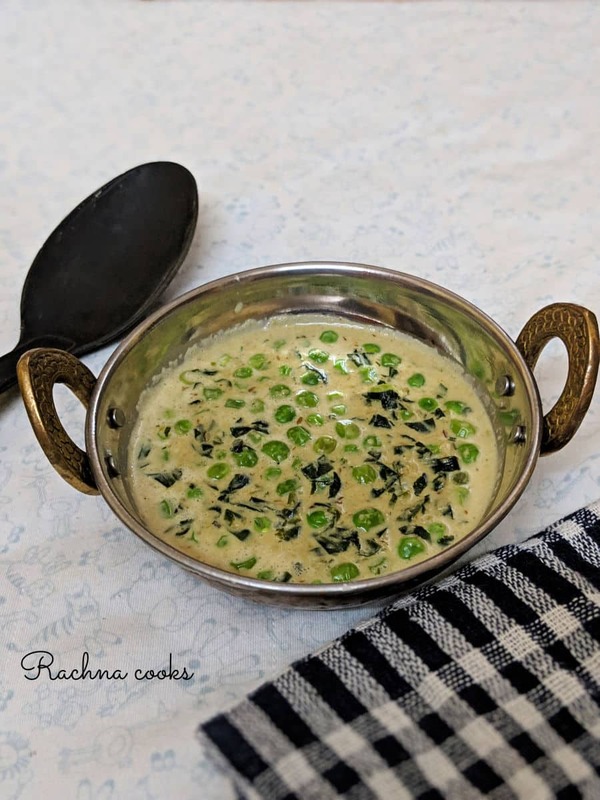 Methi matar malai is a decadent dish which is mildly spiced, rich and sinfully tasty. 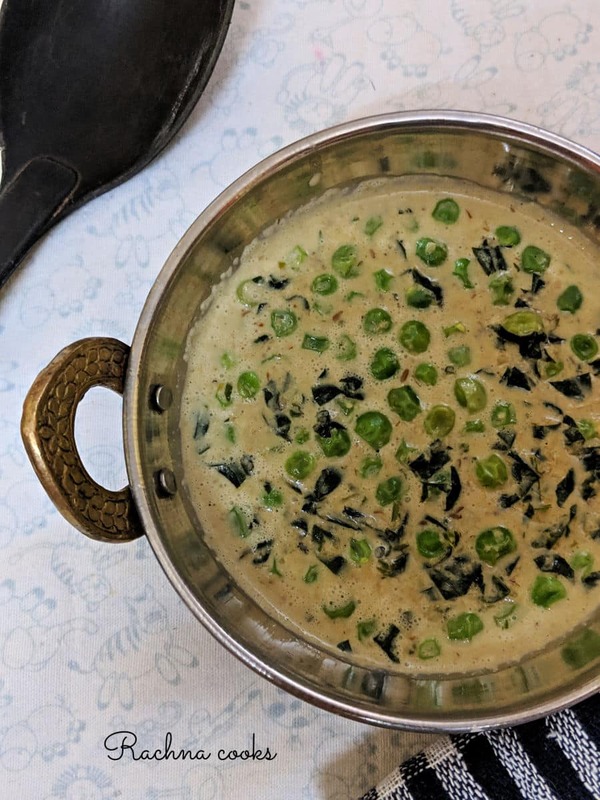 I don’t know who had thought of the combination of fresh fenugreek leaves with peas and cream in a rich curry, but whoever did really thought out the balance of ingredients well. 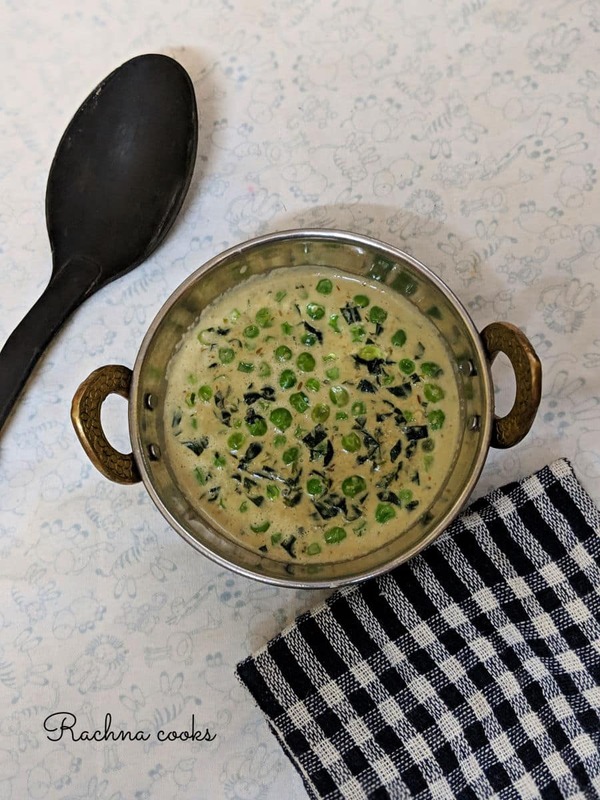 This methi malai matar is ready in no time if you have the ingredients at hand. And since I am making recipes with matar or peas everyday, it was only natural for me to make it. 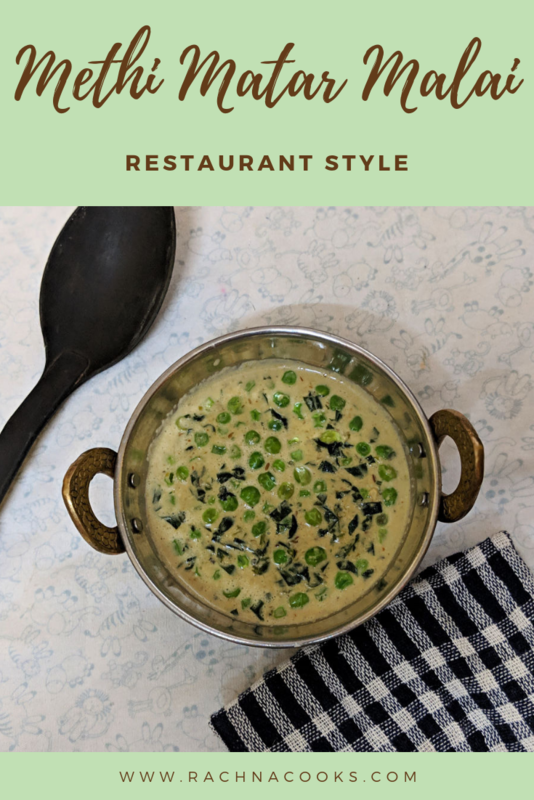 This is a rich and delicious methi matar malai recipe made restaurant style. It is mildly spiced, creamy and tasty. 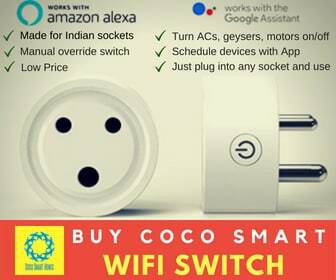 Do try it. Heat oil in a pan. Add cumin seeds and allow them to sputter. Now add chopped onion and chopped ginger and garlic. Saute for 5 minutes till they are lightly cooked. Add chopped green chillies and saute for 3 minutes more. Cool and blend to a paste. Take this paste in a pan. Add fresh fenugreek leaves and cook for about 3 minutes. Now add some water to thin down the curry. Add fresh cream along with cashew powder (or paste made with 3-4 tbsp. cashews) and green peas together. Your curry will instantly become thick and creamy. Add salt and sugar. Simmer on low heat for 5 minutes. Your methi matar malai is ready. Serve hot with rotis or rice. Use fresh fenugreek leaves only. You can use any cream. I used store bought cream. This recipe uses very mild spices and mostly lets the flavour of the ingredients shine through. Adjust the sugar used to balance the bitterness of methi or fenugreek leaves. You can thin down the curry if you don’t want it too thick. It is a rich curry so a small serve goes a long way. 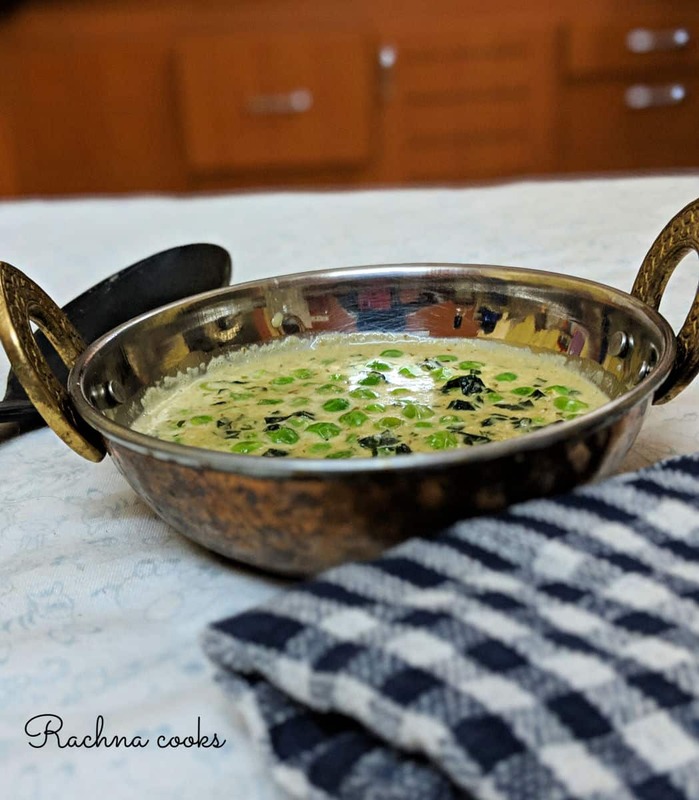 Do try this methi malai matar recipe and let me know how you liked it. Some other matar or peas recipes that you may like are aloo matar, matar paneer,khoya matar makhana, matar ka nimona and matar ki ghugni. If you liked the recipe, please share with your friends. Do follow me on Instagram and Facebook for more such healthy and easy cooking recipes. Wow.. this sounds simple. With peas in season, I will try this one. This is one of my favourite dishes and I made it a point to have it at a restaurant when I visited in November. Unfortunately, we don’t get fresh methi leaves here so I can’t make anything that uses it. Aha! This is one of my favourite dishes. We make it often at home, I like it’s mild and sweet flavor and it’s a hit with kids in our circle of friends. I like the way you have photographed it. Never thought methi and matar can go together, but this looks and feels like a delicious combination. 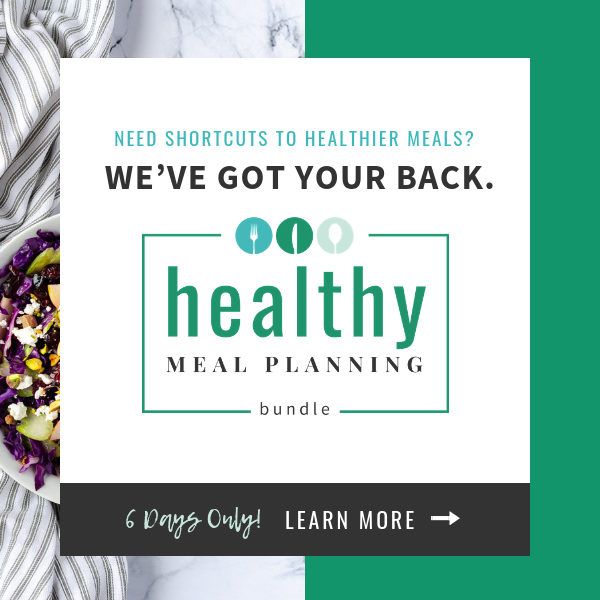 Will try it out for sure. I’m not a huge fan of peas, but this particular dish has a certain earthiness that I really like! I am not fond of peas, I can tolerate it when it is smashed and I can’t see it, but not when it is so prominent. So I have to give this dish a pass, but I have to say the photos look great, even to me (certified peas hater). Great shots, Rachna!